I have been studying and teaching what i'll call natural living and healing arts since I was a youngun, fortunate in having my backyard leading right in to a pretty dense woodland, where we kids would spend most of our time. Back then, as long as we were home by dinner, we could explore wherever and whatever we wished, not only unsupervised but in a place where no adult dare set foot. By the age of five we all carried knives, made fires, built shelters, stalked, tracked, harvested plants for food and fiber, and basically observed what Edmond Szekely called "the greatness in the smallness". And we knew, we really knew, that somehow we were a part of this all, we were safe, and that we were at home on this beautiful, flourishing planet. Now, many moons later, I find myself a relatively old dad with an 8 year old son under my wing... and the idea of letting him out on his own, with only the guarantee that he comes running home at the sound of the dinner bell, is a letting go, a trusting, that I can not even begin to consider. And I truly don't believe things are that much more dangerous now than they were 50 years ago, certainly not based on crime statistics; I just believe that we are surrounded, bombarded, with images of fear and danger and even more worrisome than that, we have never been more disconnected from, even at war with, our natural world. And though my son is developing to be a skilled young woodsman, for now it will all happen under my watchful eye. I now run a summer camp for kids where we teach nature awareness and wilderness "living" skills ( I prefer "living" over "survival" a fierce word which assumes struggle) And, before these kids learn anything about how to "make it" in the woods, before we even think about building a fire or shelter , purifying water or eating from earths bounty, I teach them the most basic of well being skills; how to breathe a full and natural breath. With the ease and calm that we get from allowing our bodies to be fully breathed, we can make wiser decisions in any situation which presents itself. Of course we, the living, all breathe, though most of us breathe as if we are not really safe, at home, on our Mother Earth. Fortunately, re-learning how to breathe naturally, even with a lifetime of self induced choking and tightening, can be as easy as, well, breathing. 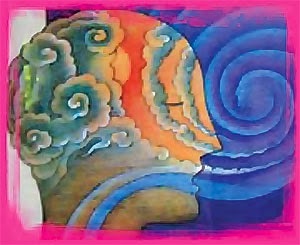 Easy but not always so simple, there is nothing more vital than re-cognizing the power of our own breath. Do I hear an Ahhhhhmen? !